Options: Five Star PBW 2 oz. 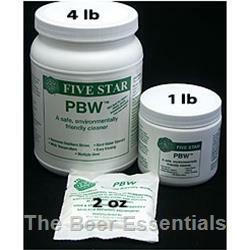 Five Star PBW 1 lb. Five Star PBW 4 lb. An alkaline based cleanser (not for sanitizing!) used in many breweries. It will not corrode stainless steel or kegs. Very effective in removing protein soils found on brew kettles, fermenters, conditioning tanks, filters and all packaging areas. Environmentally friendly.